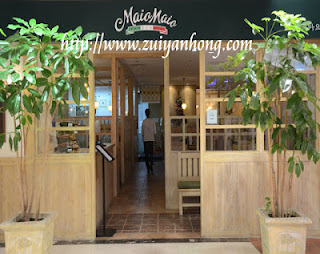 During the second night in Suwon, we went to Maio Maio Restaurant for dinner. This is an Italian restaurant which is located at the top level of AK Plaza in Suwon Station. 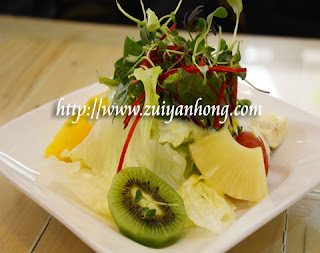 This fruit salad was one of the dishes that my son had ordered. The fruit salad was quite unique. 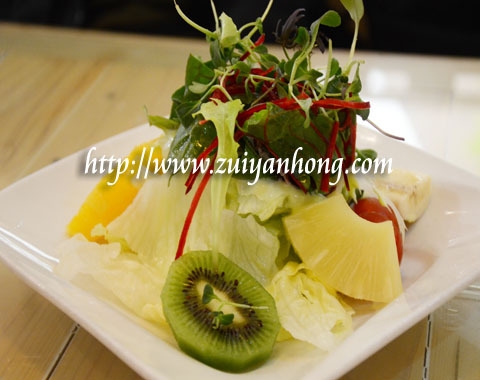 The materials of the salad were kiwi, apple, orange, banana, star fruit, pineapple, mini tomato, bean sprouts and Chinese cabbage. The second dish of our dinner was seafood pasta. 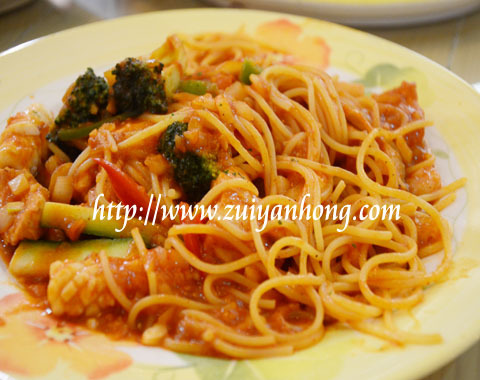 The taste of this seafood pasta was totally different with the pasta which was cooked by my wife. As you can see from the above photo, the ingredients of the seafood pasta were squid, prawn, broccoli, cucumber and tomato slices. Our last dish was seafood rice. This seafood rice was different with what I had eaten before. The materials and the cooking method of the seafood rice were not the same. Besides rice and seafood, there were egg, tomato, corn, green beans and radish cubes. For the next post on South Korea, I will blog about tourist attractions in Suwon.